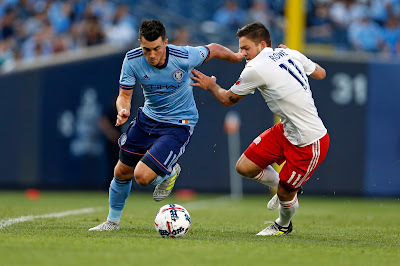 NYCFC's Jack Harrison battles New England's Kelyn Rowe. USA Today Sports. New York City Football Club saw their chance at another three points at home go down the drain when Xavier Kouassi tied it for the New England Revolutioin in the 86th minute. NYCFC had to settle for one point in the 2-2 draw with New England on Wednesday night at Yankee Stadium. This was the first time in 14 MLS fixtures that NYCFC have conceded a goal in the final 15 minutes. This game took a while to get going, and it was David Villa who gave NYCFC a spark in the 16th minute. Villa collected a pass just inside his own half before heading towards goal, drifting past two New England defenders before pulling the ball back across goal for Jack Harrison to finish from close range. Villa, meanwhile, claimed his third assist of the season. It was Harrison’s sixth goal of the season and his second in successive games. It was Villa's third assist of the season. New England was quiet until the 23rd minute when Kei Kamara got off a great shot and NYCFC goalkeeper Sean Johnson made a top-notch save. A corner resulted, and Kamara tied the scores at 1-1 with a powerful header past Johnson. The second half was slow to start, and NYCFC Head Coach Patrick Vieira made a bold move in the 61st minute, as he swapped out Tommy McNamara for Miguel Camargo. Three minutes later, Camargo scored on a header off a pinpoint cross from Maxi Moralez to put NYCFC back in front 2-1. New England got some momentum going as the game neared the end, and Kelyn Rowe had a great cross in the box to Kouassi, who headed it in to tie the game at 2 in the 86th minute. In the final minutes, NYCFC players were getting frustrated as New England's Lee Nguyen kept hitting the deck in search of penalties and breaking up the flow of the game. NYCFC's ire was also directed at the referees, who blew the whistle on the game as the clock hit 93:00 minutes, the conclusion of the third minute of extra time, as they had possession and were looking for a final shot. Extra time is not a fixed thing and if a team has possession, the referees usually allow them to play it out until they get a shot or the other team takes possession. The biggest mistake the referees made was when Villa was taken down in the box in the second half and no call was made. When Vieira was asked about that, he simply said, "I don't want to comment. I don't want to talk about the referees." Vieira said of being concerned about NYCFC starting to have trouble closing out games, "We can talk about conceding the goal late. We can talk about the number of chances we create, but yes, we just have to be more... We can talk about concentration. We can talk about focus, but we have been naive with the way we were defending today." With the tie, NYCFC is now 6-3-5, 21 points, in fifth place in the Eastern Conference, while New England is 4-5-5, 23 points, and in eighth.